We have often heard that beauty is in the eye of the beholder. That might be true, but I think that beauty comes from the heart. 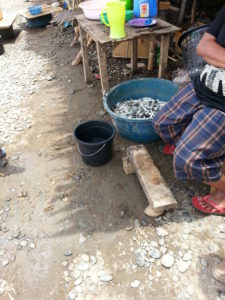 When the children were showing me around the village where the children’s home is located, they stopped at a lady that makes a living by wading out into the sea and catching fish and then salting and drying them. She was weathered and very tanned. Her face was deeply lined but had a smile from ear to ear. 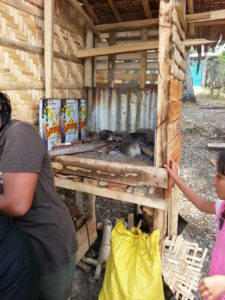 She was happy to have pictures taken of her fish drying and the cooking area attached to the end of her house but was shy when I asked if I could take a picture of her. 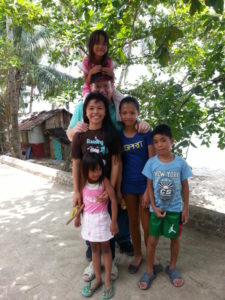 Kids showing me around the village. Babeselle and Meriam in front of me. When we left, Miriam told me, “When I get old, I hope I am as beautiful as she is.” The lady’s features would never be a cover on a magazine, but the friendliness and warmth were a reflection of the kind and loving heart that she had. Miriam had a true understanding of beauty.